You know the saying, "I try to take it one day at a time, but lately several days have attacked me at once"? That is exactly how I'm feeling lately. I don't know if it was Halloween or the fact that I still don't quite have my feet under the three kids thing yet, but I cannot recall a time in my life when I have felt so busy but accomplished so little. My house of cards seems to hinge on the predictiable. Which, unfortuately, accounts for a mere 30 percent of my day. I can predict what time breakfast will be, when the kids will be to a from school, and the fact that they rest of the day is up for grabs. It's seriously maddening. So give it up all you seasoned, amazing, put-together moms out there. What's the secret? Does this get easier? Do you just learn what to let go of? (Because lately I've chosen to let go of the ironing and Matt is not loving that.) Right now I feel like I want to hold on to everything "normal" so tightly that I'm being stretched in crazy ways. I want to do everything that we always have and I feel so frustrated and sad when it's just not possible. I think some deep breaths and a real effort at reprioritizing may be in order. We love our friends and family, but we love our baby more. Coughs, sneezes, or no flu shot, you'll have to visit at the door. There is just something about having to feel on guard 24/7 for invisible and silent invaders (germs) that is exhausting to me. I'm trying not to turn my sanitzer-loving self or my kids into clean freaks, but I can definitely feel some mental side effects coming on. We are very anxious about McKay's cardiology check up next week. Will they say it's time to prep for his surgery? Will they send us home to finish out the year? Will this never ending cycle of oxygen continue into the eternities?? One wonders. 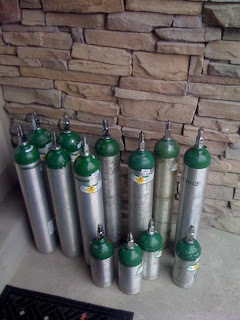 This is McKay's one week supply of oxygen. We leave the empty tanks outside in the morning and a new crop is there by nightfall. Magical! McKay is a cute little bucket of sunshine, though. He laughs and yells at his brothers to the point where he puts Preston into hysterical laughter. His happy spirit is such a gift. 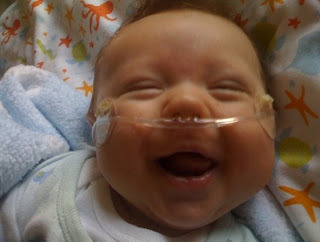 I will do all I can to help him continue to look at life through smiling eyes. Special thanks to loving Aunties who spoil him rotten and protect him like no other when I have to be away. They keep me sane. Thank you. I wish I had the secret to dealing with three little kids too, but I don't. Just do the important stuff and everything else will eventually get done. I know I keep posting about this, but doing your best to limit all the RSV germs is so hard. Just be really careful and pray this year is mild. We need it to be too! Please send me your email address. I have started a private blog. Not exciting, but it is a blog! Maybe you need to read my latest post to get a glimpse of how I have been feeling. Sounds like we are in similar places. If others look put together I believe it is a facade. Those of us with little new little ones can sympathize with each other. I thought my older ones would make it easier but in some ways it is harder..scouts, piano lessons, practices, parent teacher conferences, homework and so on. But they are pretty self-reliant which I know is hard when you have smaller ones. So, hang in there and enjoy a nice movie at home on Thanksgiving! P.S. I can't get over how much McKay looks like Tyler! As far as three kids go - I have no idea. I gave up ironing years ago (and dusting too). Okay, not really. But I definitely do it less often. With each of my kids, I became easier on myself. With my third, it was easily four months before I even considered myself as "functioning." And it is okay because with your third, you know how fast the other ones grow up. I think it's perfectly fine to let some things go and just enjoy your baby being a baby. So, if you have the resources, hire a cleaning service, order pizza, and send the ironing to the cleaners. Just for a little while. I can't imagine the stress you are under with this sweet little boy. Give yourself a HUGE break! I don't mean for this to be a lecture, but sometimes you just need permission and to know that we've all been there (at least with the feeling-overwhelmed-with-a-new-baby part). The first few months at home are such an adjustment period! I can relate with you on wondering how you are going to do all the traditions you are used to doing. I think that has been the hardest thing for me is to see everybody going on trips and fun family activities while we are still here hanging out at home. For outings, we basically just split up and one of us stays home with Gracie or we get a trusted parent to watch her and we all go out as a family. About RSV and the germs, I am probably not paranoid enough. I just have my kids wash their hands before they touch the baby and try to stay away from her if they are sick. I have had a couple of my kids sick and it has not transferred to Gracie yet. Gracie has not been sick one day since we have been home (5 1/2 months) so let's knock on wood that this winter is not terrifying! I think you can drive yourself crazy with the germ thing. I just figure, do what you can do and then just count on our little ones getting their share of the sickies this winter. Give yourself some credit, you are doing a great job!! Your little guy is darling and someday, it will get easier!! By the way, I send ALL of my husband's dress shirts out to be laundered and pressed through a company called Ironed Out and About. You put the shirts in a bag on your door, they pick them up one day and deliver them cleaned and pressed the next day. They are great, give them a try!! I love the picture! He's adorable. I've rarely ironed Brian's shirts. Men with two arms are fully capable of doing their own ironing so don't feel a bit bad about it! P.S. Wylie, Cooper, and Talia "got shot for Mac"; although we don't interact directly with McKay, we do interact closely with Preston on Sundays and don't want to send any unnecessary germs home! I know you're a litle teeny tiny bit of a control freak and as your friend who loves you dearly, it's ok to let stuff go. For instance, you don't have to vaccum your house 3 times a day. I know you love to hear the carpet clearner guy say your carpets are the cleanest he's ever cleaned. But let it go, once a day is plenty or even every other day! You know I'm kidding, well kind of! Seriously, I've decide that every woman has to let something go. There's just no way to do it all and have peace and harmony in the home. Just choose a few things now that aren't a huge deal and as you get used to 3 children slowly add back in what you want to do. I agree with your friend who said have the shirts cleaned, it's so worth the money. You are truly an inspiration to me just because you're you. I don't care if your house is dirty and you haven't done your hair and makeup all week. there is no trick - no magic - no secret. Hi. I'm a friend from Matt's mission, just stopped by your blog for the first time. No, it never gets easier just remember the saying "Dull Women Lead Immaculate Lives." Life with 3 is just crazy. But it is so fun. Good luck and I hope your little one stays well. Mine had breathing and lung problems when he was little like that and we used Theives Oil from Young Living Oils to help boost his immune system. Just a drop on each foot seemed to help a ton. Oh Mind! It is hard to let things go, and it's really hard to try to convince you, that you need to let some things go! Just know that every mother struggles with what to do. You are most important, so do the things that make you feel good. You will be a better mom if you do those things first! You are doing a great job! You are a wonderful mom, and life is crazy! Give yourself some credit. The picture is darling! I just want to kiss hiss little face off! Germs are scary! Hopefully it will be a mild year. We will not come around if we are sick, I promise! I hope others will do the same! I only have two, and some days feel like I am going crazy. I can only imagine what you are dealing with. However, I know that you are doing a beautiful job. I have loved reading your blog. You are amazing and deserve major credit for all you are doing. I hope you don't mind I linked to your blog on ours. Mindi! I always look forward to reading your new posts on your blog! You are amazing! I can only imagine how hard some days must be, I have 3 kids of my own, two teens and a 3 yr. old! It's really tuff some days, I have learned just too slow down, and know that certain things will be there tomorrow. Be sure to take out a little time for you! (easier said than done I know) but you deserve it! All us busy Mommy's do! I TRUELY THINK YOU ARE AMAZING! Your boys are very lucky! And that picture of McKay is ADORABLE! Oh Mindi, can I please come over and give you a serious hug right now? I love your eloquence and honesty. How is it that you can be inspiring when you're semi-complaining.